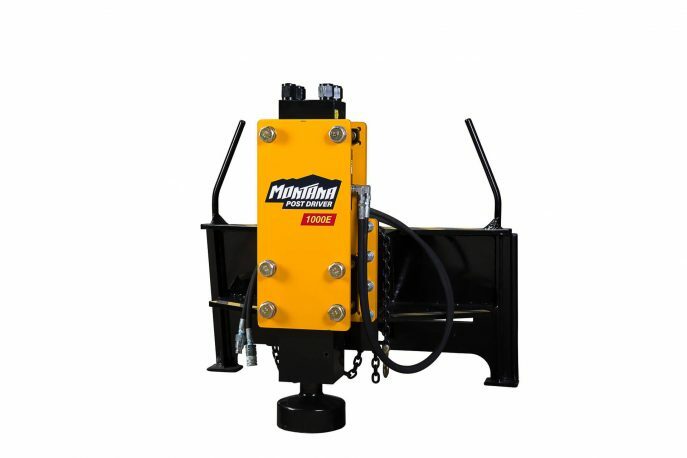 The Montana Post Driver is a serious productivity tool built on hydraulic concrete breaker technology, enabling you to install fence posts even in hard and rocky ground. We have seen experienced crews run at rates up to 2 posts per minute in favorable conditions. 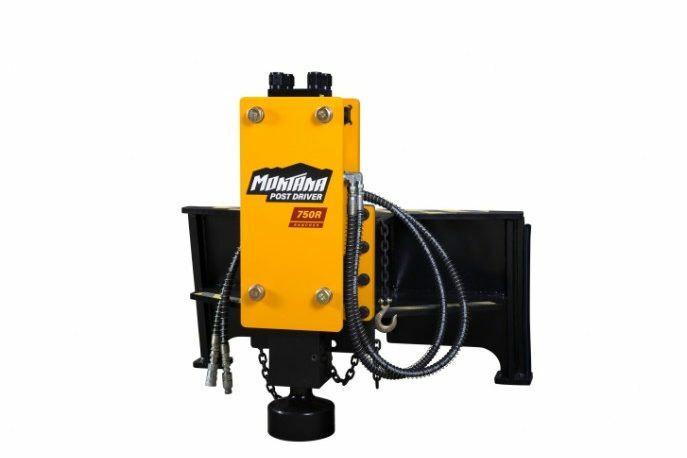 Attaching one of these post drivers to a skid loader can be done in less than a minute. 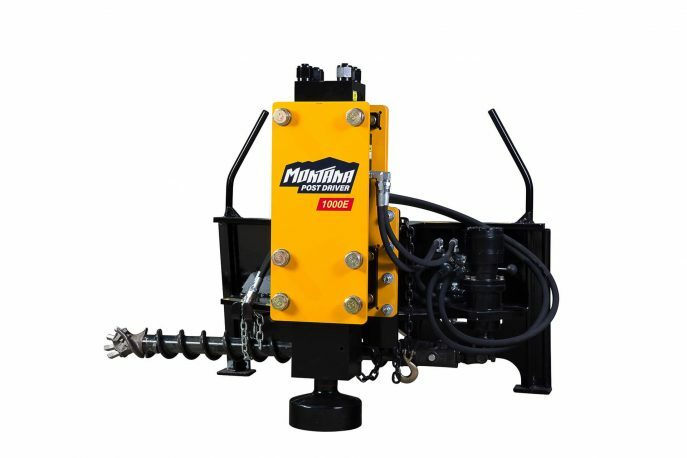 Choosing a Montana Post Driver will give you ease-of-use, longevity, and optimum efficiency. Triple purpose chain: Acts as a plumb bob, an adjustable depth gauge, and a post puller. Post rack: Work quickly using the convenient post rack built into the frame of the post driver on the skid steer units. Low profile: Doesn’t tip over when detached like most other post drivers. Low maintenance: Only one grease fitting and two moving parts give you hours of hassle-free operation. Three size options can be matched to your skid steer or excavator to give you maximum efficiency. All models include an excavator or skid steer mount. We stock all parts for these breakers and offer a one year warranty! Weight of Post Driver with skid steer mount: 1350 lbs. 2000 lbs. 2300 lbs. Min. Skid Steer Lifting Capacity: 1500 lbs. 2500 lbs. 3000 lbs. Weight of Post Driver with excavator mount: 800 lbs. 900 lbs. 1200 lbs. Required Excavator Size: 8,000-14,000 lbs. 12,000-18,000 lbs. 14,000-28,000 lbs. Also, our original A-Series is still available. 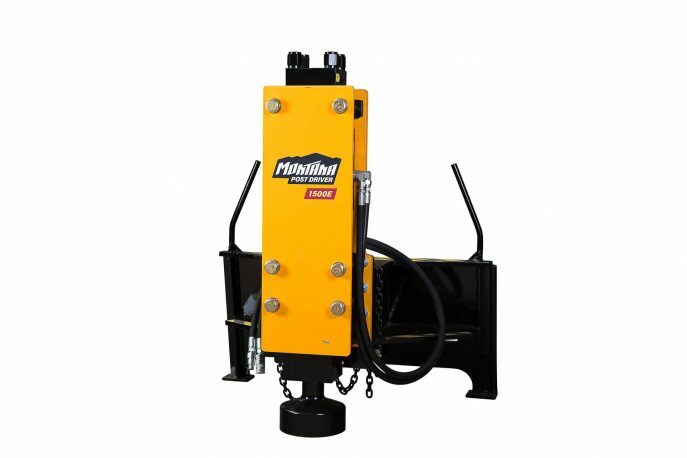 The auger attachment will attach to any skid steer mounted Montana Post Driver. After over 30 years of fencing and building my own equipment, from all types of wire machines and driver, doing 100’s of miles for various government and private entities, I find that the Montana Post Driver is one of the most productive machines I have purchased. I can very much see that matching the size of the driver with the type of work being done can be very useful and profitable. I would recommend any large fence companies to own various units to meet all their fencing needs.